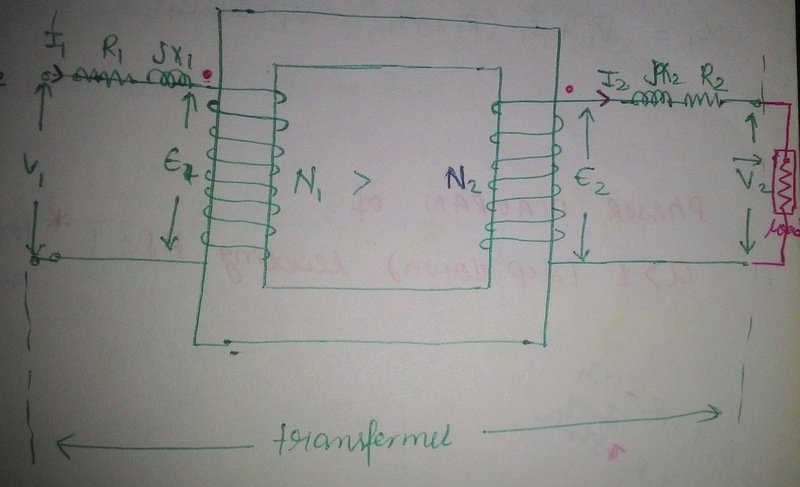 Here we will discuss Electrical Transformer Notes. Electrical Transformer can be Define as a Device in which l electrical energy transfer from one circuit to another without any direct electrical connection by setting up magnetic medium with the help of mutual induction between two windings without changing its frequency. without changing its frequency it transfer energy. main reason for transformation of energy in electrical transformer. Faraday's laws says that , "the Rate of change of flux linkage with respect to time is directly proportional to the induced EMF in a conductor or coil". there must be a change in flux linkage in the second winding or coil. So now According to Faraday's law of electromagnetic induction , there must be an EMF induced in the second windings due to flux linkage. If the circuit is complete i.e. close than there must be a flowing current will set up. This is basic principles of working of Electrical Transformer. alternating, there will be obviously a rate of change in flux linkage with respect to time in the second coil. Naturally emf will be induced in it as per Faraday's law of electromagnetic induction. 1. Primary/Source Winding of Transformer- where alternating current is applied and produces changing magnetic flux. The magnetic flux is produced by the primary winding and it will flow through iron core which have some reluctance value. Reluctance is similar to Resistance in Electrical Circuit. The reluctance path linked with secondary winding. It create a closed magnetic circuit. It link the primary circuit to secondary circuit though magnetic flux. 3. 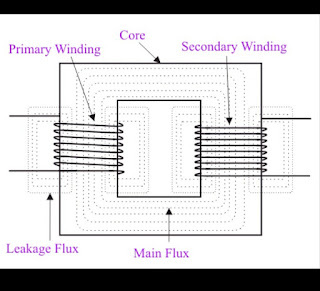 Secondary/load Winding of Transformer- the windings which is connected to load is secondary winding. 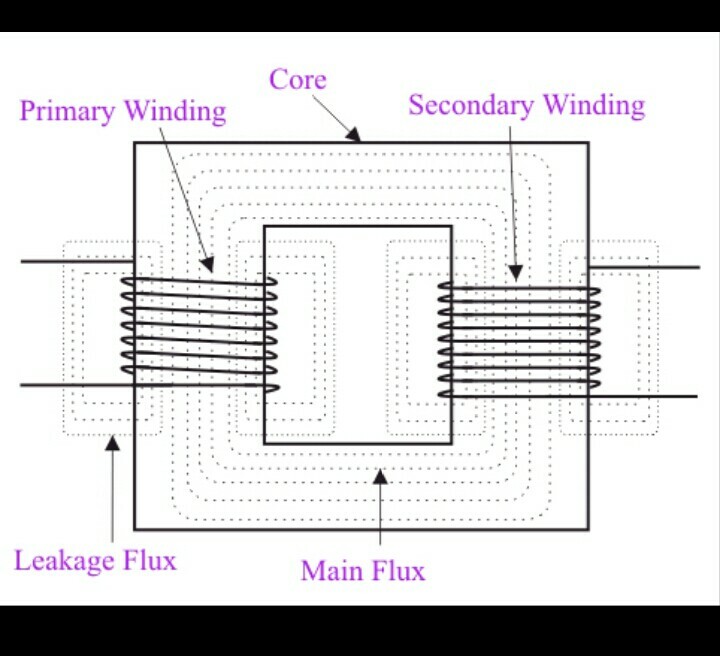 Flux passes through the core and link with the secondary winding. Primary side = connected of source side. Secondary side- connected to load side. Primary and secondary side connected by core made up of silicon iron. The flux is generated by primary source which flow in transformer core and is linked to secondary side which induced voltage in secondary side. So core has fixed dimensions made at the time of transformer manufacturing. 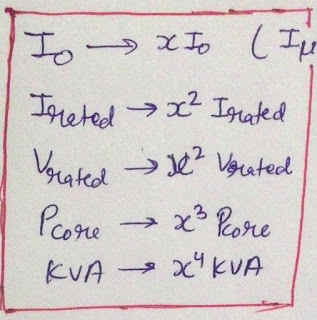 Here we will discuss what will happen if core of transformer increase by some factor (let x). 1) no load current of transformer - no load current will increase by factor "X" . 2) Rated voltage and Rated current - will increase by factor "X² " . 3) transformer losses - there are two type of transformer loss i.e. core loss and copper loss. Core loss is also known as iron loss or magnetising loss. Iron loss is constant but copper loss is variable. When core dimensions increased than Copper loss will increase by factor "X^3". 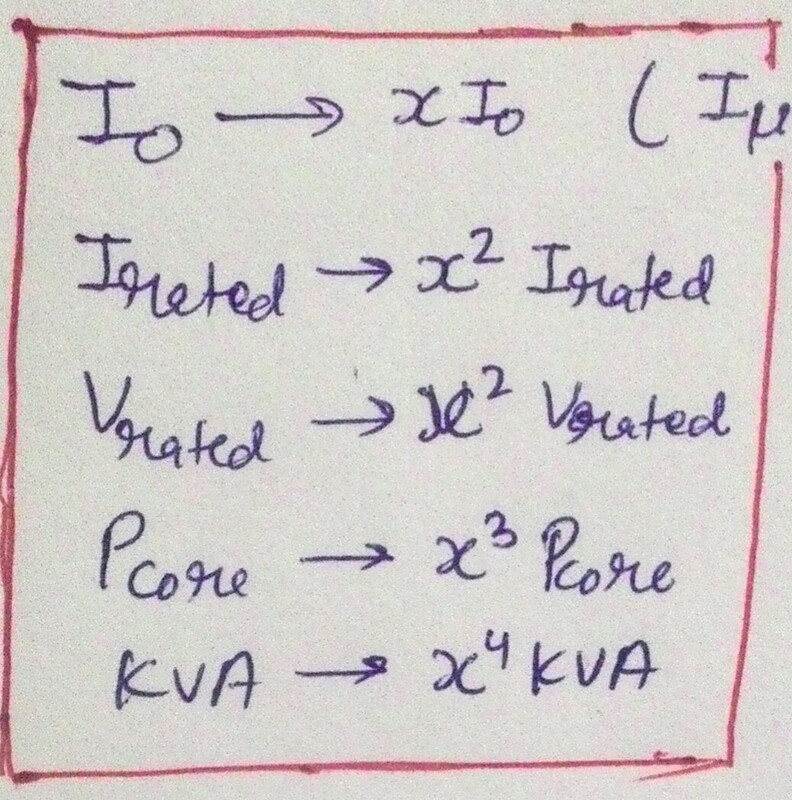 4) KVA rating of transformer - kva rating will be proportional to X is tp power 4 i.e. if transformer core dimensions is getting double than its KVA rating will be 2^4= 16 time. 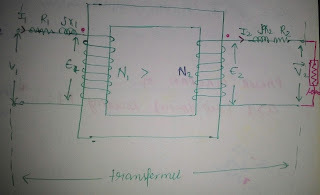 Today we have uploaded most important question from Electrical Core Subject i.e.Electrical Transformer. Transformer subject is one of those subjects for every electrical exam which has large weighed in any electrical competitive exam. 1.In three pin plug 6 Amp. 220v AC rating. why earth pin diameter is higher than ohter two pin? what its purpose ? should we maintain the frequency constant if so why it is only 50 ? We can have the frequency at anyfrequency you like, but than you must also make your own motors, transformers or any other equipment you want to use.We maintain the frequency at 50hz or 60hz cos the world maintains a standard at 50 /60 hz and the equipment are made to operate at these frequency. Excitation is applying an external voltage to DC shunt coil in DC motors. 4.Different between megger and contact resistance meter? Megger used to measure cable resistance, conductor continuity, phase identification where as contact resistance meter used to measure low resistance like relays ,contactors.in an electric equipment in order to protect he equipment in occurance of fault in the system. 5.Why transformer rating in KVA instead of KW? The rating of any device depend on losses of the machine. In a transformer the losses are iron losses which depends on voltage and copper losses which depends on current so there are no losses which depend on power factor hence transformer is rated in KVA. There are 2 losses in transformer. One is copper loss which depends on current and the other is iron loss which depends on voltage. These two factors are not affected by the power factor. This is why transformers are rated in KVA and not KW. Single phase KVA = Amps x Volts/1000. Single phase KW = Amps x Volts x pf/1000. 3 phase KVA = Amps x Volts x 1.73/1000. 3 phase KW = Amps x Volts x 1.73 x pf/1000. yes there are two type of losses in transformer is that ohmic losses and core losses . ohmic losses due to transformer current and core losses due to transformer voltage. these losses are due to transformer voltage and current. and these losses not depends on load ie kw that's the way its rating in kva.. If you have any doubt on theoretical or numerical questions than please comment below.